Liana Lodge consists of 9 double cabins with a total capacity of 13 double-rooms (with two beds), 3 three-bed rooms and one four-bed room. 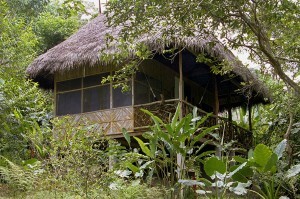 The cabins each have a large balcony and are situated in the lush green of the typical rainforest vegetation and are accessible by natural paths. The central building hosts the reception area with the hotel administration, the restaurant and bar, and an open fireplace where you you can sit comfortably and enjoy a few drinks from the bar. 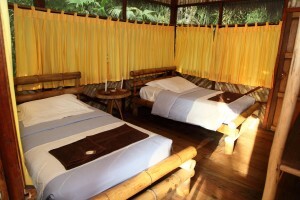 In the rainforest there is no electricity in the restaurant and rooms. For this reason you can enjoy tranquil evenings by candlelight and the sounds of the forest. A unique jungle experience. 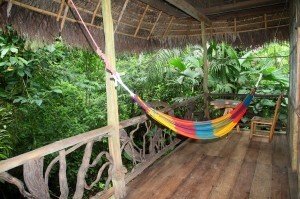 While enjoying this respite and relaxation, you can still charge your devices in our reception..